I was clearing out some bookshelves recently and I came across this little book. 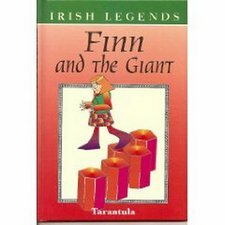 It’s part of a set of Irish Legends re-told for young children. The Finn MacCool story reminded me of the time we visited the Giant’s Causeway in Northern Ireland with CAM. 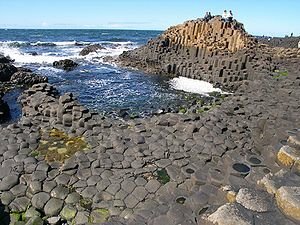 Before I describe our visit to the Causeway, I need to first share briefly the legend of Finn MacCool and how he is associated with the Giant’s Causeway. Legend has it that he was a great man, a giant of a man even. According to the story, he built this causeway so that he could walk to Scotland to fight a Scottish rival – and that Scottish rival (who was also a giant) ripped up the Causeway so that Finn couldn’t follow him home! We took a day trip to visit the Giant’s Causeway when CAM was almost five. 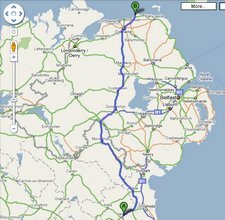 As we drove north from my parent’s house in County Meath, I was most moved by the ease of the journey. This was my first visit back to Northern Ireland since I’d graduated from Queen’s in Belfast in the early Nineties. The impact of the Good Friday Agreement was visible in many small ways but most noticably in the fact that the border crossing into Northern Ireland was a five-minute stop – nothing like the multi-hour wait in a heavily armed checkpoint which I’d experienced on every trip between home and school just a few years earlier. We stopped for lunch in the town of Bushmills. After eating, as we returned to the car, CAM noticed and was immediately fascinated by the painted kerbstones. During the Troubles, painting the kerbstones either red-white-blue (for Loyalists) or green-white-orange (for Republicans) was a common way to mark a neighborhood affinity to one side or the other – as you can see in this photo taken in the Shankill Road area of Belfast. For a kid coming from Seattle, these markings were truly confusing. In CAM’s world view, a set of yellow kerbstones indicated a Bus Stop and a set of red kerbstones meant “No Parking”. “But Mom, why is the road painted like that?” he insisted at the very top of his voice – and he wouldn’t budge without an answer. Standing in the middle of Main St. in a town which wasn’t yet showing many of the beneficial effects of the improving political situation while trying to explain the complicated history of Ireland to a preschooler in simple terms (and in Southern Irish accents) was not a very comfortable situation in which to find ourselves. Thankfully we had Finn McCool on our side. With tales of giants tossing man-sized rocks, making and breaking bridges that could cross stormy seas and battling from one end of the country to the other we managed to distract our inquisitive little guy. Thankfully, he was duly impressed by the Causeway. After such excitements we felt we deserved our subsequent visit to the nearby Bushmills Distillery. And CAM got all his questions about Irish history answered on the drive home. This entry was posted in International Escapades, Ireland and tagged Giant's Causeway, Ireland, Northern Ireland on November 17, 2009 by wandermom.